We Had a Super Bowl! On Wednesday, February 21, hundreds of Minneapolis students walked out of class to protest gun violence in schools across the country, and came to City Hall to demand that we take action. In response to and in support of their leadership, I worked with Intergovernmental Relations Committee Chair Andrew Johnson and Council Member Jeremy Schroeder to add to our state legislative agenda support for a statewide ban on assault weapons, bump stocks, silencers, and high capacity magazines. As I made clear in my comments, this is a fight with the NRA, and it’s one we need to win if we are going to address gun violence in Minneapolis or across the state. You can see my comments here or watch the full committee hearing with students' public comments here. On Friday the 23rd, at our regular City Council meeting, we heard from students, Moms Demand Action Against Gun Violence, and Mayor Jacob Frey before voting on a resolution that honors and remembers all victims and survivors of gun violence and declares that the City must do more to reduce gun violence and keep our schools and communities safe. Last fall, the Department of Community Planning and Economic Development (CPED) issued a Request for Proposals (RFP) for the Grain Belt Riverfront Redevelopment Area, which is in between Marshall Ave. NE and the river between 13th & 14th Aves. NE. CPED received three proposals, and City staff are in the process of evaluating those proposals in a group that includes my staff and a representative from Sheridan Neighborhood Organization. These proposals are still in a conceptual phase, and the final project design will undoubtedly be different from these, regardless of which developer is chosen. Please join CPED staff and I for an Open House on Thursday, March 8 to share your feedback and ideas about this project and the three concept proposals that the City has received. WHEN: Thursday, March 8th from from 5:30 - 7:00 P.M.
After this Open House, City staff will meet again and make a recommendation on a developer for the City to enter into exclusive negotiations with regarding this project, based on their proposal. Once they make that recommendation, there will be a 45-day public comment period before the City Council acts on that recommendation. You can see the project RFP here (click on the "Development" header). The Minneapolis Business Portal is a new online platform designed to connect entrepreneurs and small business owners to the information and resources needed to plan, launch and grow a business in the city. The online portal features valuable tools to help startups and existing businesses, including a comprehensive checklist of the required steps to start a business, a library of business support resources, financing information and instructions on applying for a business license. For additional support, you can also contact the Small Business Team, who connect entrepreneurs with key City staff who can help you get your doors open quickly and efficiently. Between the City of Minneapolis, Hennepin County, and the State of Minnesota, there are a lot of upcoming projects happening in Ward 3 to repair and improve our transportation infrastructure for drivers, pedestrians, and bicyclists. 35W@94: Downtown to Crosstown: this is a major project by MnDOT that began last year and will continue through 2021. In addition to periodic closures along I-35W south of downtown, the most notable impact to downtown will be the closure of the 11th St. off-ramp from westbound I-94 beginning this spring. Visit the project website for more information. Hennepin Avenue downtown between Washington Ave. & 12th St: the Hennepin Downtown Street Reconstruction Project will reconstruct the roadway from Washington Avenue to 12th Street beginning in 2019. City staff is in the preliminary stages of planning and design and would like to talk about current plans and hear from people who use the busy street. For more information about the project and to take a survey about your Hennepin Avenue experience, visit the project website at www.hennepindowntown.com or contact the project staff at hennepin.downtown@minneapolismn.gov or 844-887-8330. North Loop Paving Improvements: in 2019, the following streets in the North Loop will receive paving and streetscaping improvements: North 3rd St. between 5th Ave. N. and 10th Ave. N.; 5th & 7th Aves. N. between Washington and N. 4th St.; and 8th & 9th Aves. N. between Washington and N. 3rd St. For more information, visit the project website or contact Forrest Hardy at Forrest.Hardy@minneapolismn.gov or 612-673-5951. 5th St. NE Resurfacing & Bikeway Upgrade: in 2018, 5th St. NE will be resurfaced between E. Hennepin Ave. and 9th Ave. NE. This project will also upgrades to the current bikeway. For more information, contact Erin Feehily at Erin.Feehily@minneapolismn.gov or 612-673-3614. U of M Protected Bikeways: in 2019, the City will install 2.6 miles of protected bikeways connecting the University of Minnesota and surrounding neighborhoods, including Marcy-Holmes. For more information, visit the project website or contact Simon Blenski at Simon.Blenski@minneapolismn.gov or 612-673-5012. On February 9, the City Council voted to add to our state Legislative Agenda that we "Fully support the Minnesota Department of Transportation's request for $13 million necessary for the rehabilitation and preservation of the Stone Arch Bridge; an iconic landmark and destination for Minnesotans and visitors alike." The Stone Arch Bridge truly is an iconic Ward 3 landmark in the heart of Minneapolis, and I will work closely with our Intergovernmental Relations team in the months to come to make sure we maintain this vital public asset for decades to come. It's easy to forget that just a few weeks ago, we had this little thing called Super Bowl LII happen in downtown Minneapolis! I want to take the time to offer my thanks and congratulations to City staff, who did an incredible job showing off our city to the world. It was a huge, complex undertaking that took two years of planning, and the work paid off. I had a chance to visit the Minnesota Super Bowl Joint Information Center where city staff from a variety of departments worked side by side with staff from the Minnesota Department of Transportation, Metro Transit, Hennepin County, Ramsey County, and more to make sure we were speaking in one clear voice to give everyone accurate information about mundane things like traffic, and to be ready to respond if anything had gone wrong. I'm so appreciative of everyone's hard work and dedication! I also had a chance to visit the multi-agency coordinating center and see the agency coordination on public safety, which was very, very impressive. I publicly raised concerns about the visible military presence downtown and some civil liberties questions around surveillance, which I'll continue to raise. None of those concerns detract from my gratitude for the extraordinary professionalism and successful planning that went into keeping everybody safe with huge crowds at multiple locations around the city. I personally witnessed plain-clothes officers making targeted arrests of people selling fraudulent tickets, protecting fans from getting ripped off. I especially appreciated the way Minneapolis Police responded to protest activities in ways that de-escalated tensions and kept everyone safe, including the demonstrators. We still have some analysis to do to figure out whether the economic impact of this event was everything we hoped, but what we can say for sure is that the performance of our City staff was everything we hoped for and more, and I'm prouder than ever to live in and work for the City of Minneapolis. Human trafficking is a problem throughout the year, not just during big events like the Super Bowl. However, Minneapolis police and 17 other law enforcement agencies used the 10 days of Super Bowl events to crack down on this illegal activity. The Super Bowl Human Trafficking Operations team posted 30 to 40 decoy ads on several online sites, and 1,500 individuals responded. From those, 94 arrests were made and 89 charged with felonies. Of those arrested, 28 had no prior criminal histories and 55 had only traffic violations on record. In addition to the arrests, police made 28 in-person contacts with potential victims. All were offered services through YouthLink and the anti-trafficking outreach team at SOURCE. Minneapolis Police led the Super Bowl Human Trafficking Operation. The workgroup included police departments from Bloomington, Eden Prairie, Minnetonka, Oakdale, Plymouth, Saint Paul, Shakopee, Savage and Woodbury; the sheriff’s offices in Hennepin and Washington counties; the attorney’s offices in Hennepin, Ramsey, Washington and Scott counties; Homeland Security Investigations and the FBI. 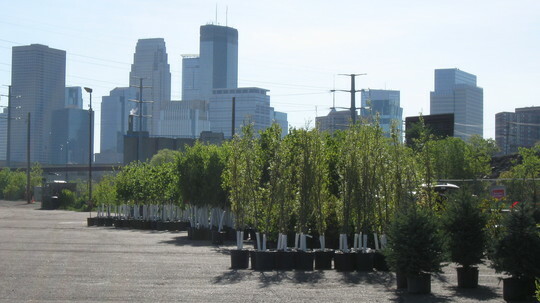 Minneapolis property owners (Minneapolis residents, businesses and nonprofits) can enter the City's low-cost tree lottery any time now through March 9, and lottery entrants will hear back by March 14. About 850 property owners will be able to order a five-to-eight foot tree to plant in their yards. The sixteen varieties available this year include large species, flowering trees and several kinds of fruit trees. Large species shade trees are $30 each. Fruit trees and smaller species are $40 each. Comparable trees cost about $125 at a nursery. Limit one tree per property owner. Trees must be picked up May 19, 20 or 21 at the City of Minneapolis Impound Lot. Volunteers will be on hand to help load each new tree and a complimentary bag of mulch into vehicles. Enter the lottery at treetrust.org/minneapolis-tree-sale-lottery. In the past 12 years, the City Trees program has provided approximately 14,000 trees for planting on private property to beautify our neighborhoods, help clean the air we breathe, save on our energy bills by keeping the city cooler in the summer, provide homes for wildlife, and help manage stormwater. Attention, Minneapolis Solid Waste & Recycling customers: watch your mailboxes for the 2018-2019 service guide arriving soon! The guide includes a collection calendar and information on all Solid Waste & Recycling services. You are also invited to participate in this 10-minute services survey. The information gathered will help staff evaluate current outreach and educational messages and help guide future conversations on potential program changes. Survey participants will be randomly selected to win one of 40 prizes valued at $10 each. If you would like a survey mailed to you, please call us at 612-673-2917. We held our first Good Morning Ward 3 in February with Public Works Director Robin Hutcheson and had a great discussion about the City's Vision Zero initiative to end traffic-related deaths. Join us on March 21st with special guest Heather Worthington, Director of Long Range Planning with the Department of Community Planning and Economic Development (CPED) to hear about the City's comprehensive plan, Minneapolis 2040. Wednesday, March 21st from 7:30 - 9:00 a.m.